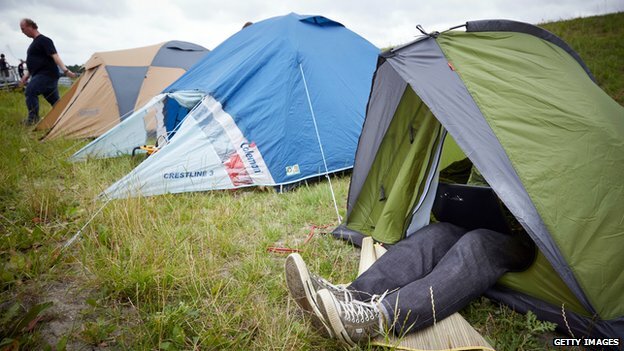 Carry on camping – can a week under canvas reset our body clocks? Researchers say that camping for a week can reset the biological clock that governs our sleeping patterns. The scientists argue that modern life disrupts our sleep through exposure to electric light and reduced access to sunlight. But after spending time in the great outdoors, the researchers say the body clocks of eight volunteers synchronised with sunrise and sunset. All life forms on earth have evolved biological rhythms that anticipate sunrise and sunset. Researchers have found that the widespread availability of electric lighting from the 1930s onwards has affected our internal circadian clocks, allowing us to stay up much later than evolution intended. The scientists in this study first analysed a small group of volunteers as they went about their normal lives, and recorded their exposure to natural and artificial light. By looking at levels of the hormone, melatonin, they concluded that the lighting of our modern environment causes around a two hour delay in circadian clocks. Melatonin rises just before we go to sleep and decreases through the night until we wake up. The study participants tended to stay up until after midnight and to wake up around eight in the morning. Their melatonin levels, however were still high for several hours after they got up, indicating they were out of synch with their natural rhythms. The scientists then took the volunteers camping for a week in Colorado. 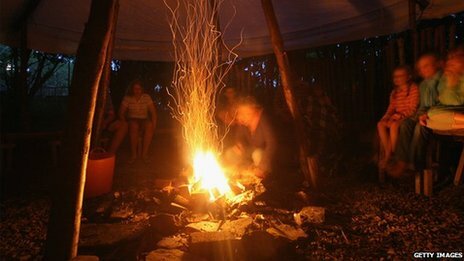 Flashlights and electronic devices were banned, the only night time light was the glow of a campfire. The result was that the waking and sleeping patterns of all eight volunteers synchronised with the rising and setting of the Sun. “They all shifted to an earlier time,” said Prof Kenneth Wright from the University of Colorado in Boulder. What surprised the scientific team was the increase in the amount of sunlight the volunteers experienced through their camping experience, around 400% more than they were normally exposed to. “We think that modern electric lighting patterns and a reduction in exposure to sunlight are contributing to later sleep schedules and difficulties with alertness in the morning,” said Prof Wright. While the sleeping patterns of the volunteers shifted back about two hours, the total amount of time they spent sleeping stayed the same. The small scale of the study leaves many questions unanswered – would similar effects be found on people who normally lived with more or less exposure to light for instance? Prof Wright acknowledges that there is much more work to be done. “We’d love to see this followed up in different parts of the world. We are studying healthy people, we’d like to see people who have realsleep problems. This is just the first step,” he said. And while it’s not possible for everyone to go camping all the time, the scientists say that some small, simple changes to the way we live our lives could help us attain some of the benefits of sleeping under the stars. “Start off your day with a walk outside,” said Prof Wright.